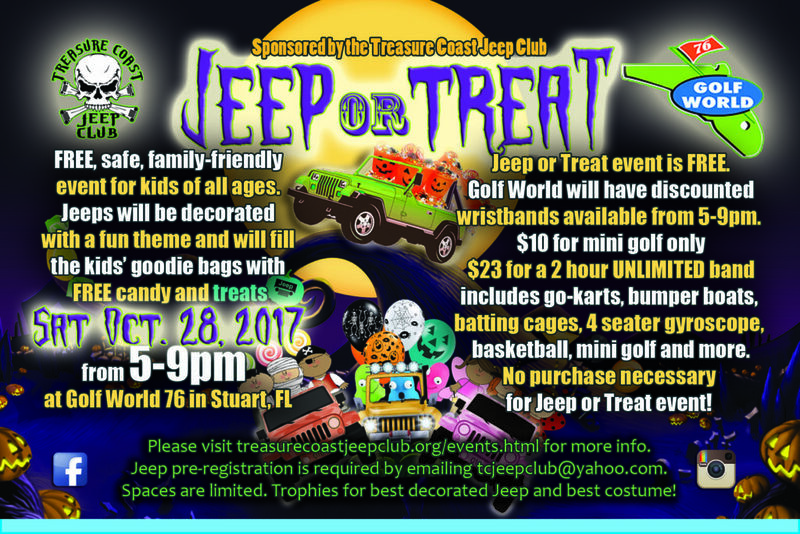 Awesome Jeeps will be decorated for Halloween and giving out FREE candy and treats to kids from 5-9 pm. This is a free event that will be held in the parking lot of Golf World 76. Discounted wristbands will be available for Golf World’s attractions (but are not required for the Jeep or Treat event). $23 for a 2 hour all access wristband and $10 for 2 hours of mini golf only. See you there! For Jeep owners interested in participating in this event, please visit treasurecoastjeepclub.org/events.html first for detailed participation information. Jeep pre-registration is required and spaces are limited.